Tunisia, Bradaa: cops force end to 3rd day of sit-in on motorway following general strike protesting unemployment Unfortunately these protesters seem to have illusions in NGOs helping their movement (see here). 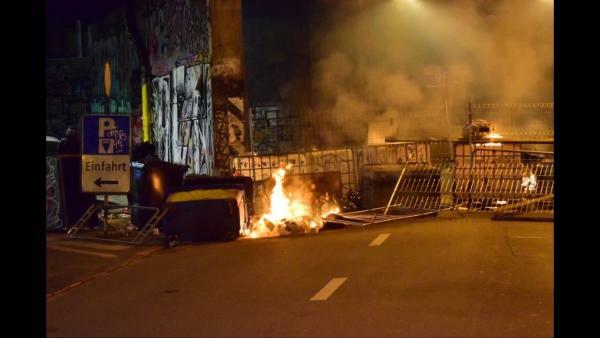 Switzerland, Bern: 3rd night of protests against squat eviction banned – 50 masked protesters erect barricades, attack cops with fireworks, etc. UK, London: anarchists squat building next to Queen’s garden; re-name it “Rogue Embasssy” See also here. 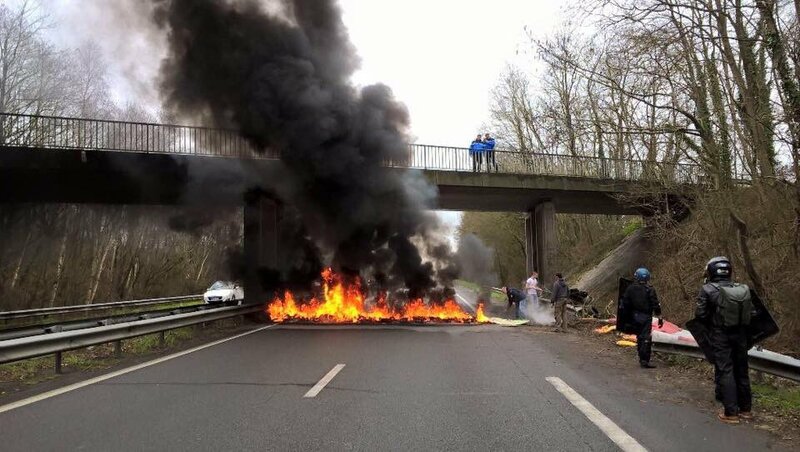 France, Essonne: 2 cops badly injured by about 15 youths in ambush …Seine-et-Marne: cop car stoned after being blocked by barricade of burning bins …Val-de-Marne: cops get tear-gassed for once, by about a dozen youths…Yvelines: 20 or so youths attack cops with molotovs, stones, heavy duty fireworks…Hauts-de-France: bins burnt, cops attacked with and injured by concrete blocks…Nice: firefighters stoned trying to extinguish burning CCTV camera Elsewhere in the past, cameras have been destroyed to stop surveillance of drug dealers, but another article (no link) said the cameras were destroyed after someone was identified after escaping from the cops in the centre, so it’s probably not drugs-related. This mentions 60 attacks on cameras in Nice in 6 years…Nice being, I think, the French city with the most CCTV cameras (at least, proportionate to the population). 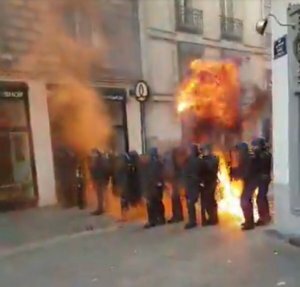 Anarchist report here: “A new gathering for Théo and all the victims of the police, in solidarity with Aulnay and all the defendants, took place this Wednesday, February 15 at 6pm, in Barbès, in the eighteenth arrondissement, unsurprisingly under high Police surveillance. A little before 9 pm, police sirens are heard and the first vehicles of cops appear. There’s a bit of a panic on the protest side, it scatters in all directions, and the cops arrive in numbers everywhere, by scooter, car or van. It is really hot, several arrests …. The cops chased us to the quays of the Seine and the island of Saint-Louis! Israel: haredim orthodox jews clash with cops in different parts of country on 3rd night of protests supporting fellow haredim refusing IDF conscription “… protesters danced in the middle of the road, even while being blasted by the water cannons, and sang songs about their devotion to God and the Torah. According to the police, some 200 protesters arrived at Shilat junction by bus, where they attempted to stop traffic, and Route 1 was temporarily blocked” More here. See the entry for 21/8/16 here for a critical discussion about the strange contradictions of this Jewish sect. In fact, despite their admirable resistance to the draft, their leaders, amongst other things, are prepared to make alliances with obnoxious anti-semites like the French comedian Dieudonné. Like having a friendly chat with your future torturers. The enemies’ apparent enemy is rarely our friend. 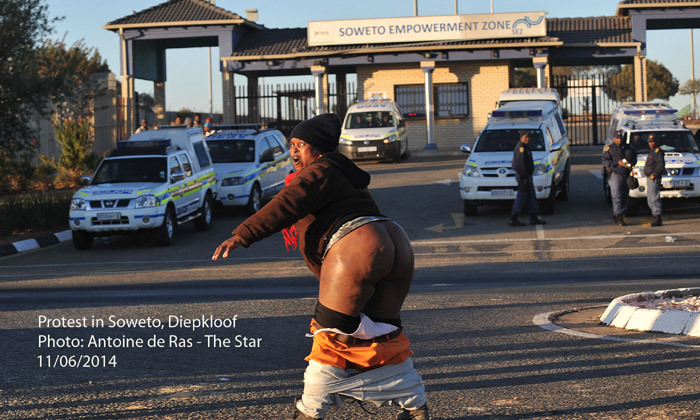 South Africa, North West: 6 shops looted over days of protest over lack of water This claims that it was foreign-owned shops that were looted, but the media almost invariably say this even when it’s not exclusively the case. We don’t know if this xenophobic-targetting took place in this instance. There’s a danger in giving credibility to these mainstream liberals and watering down the critique of their more general support for the system in the hope of being reported and/or interviewed. One should never speak to the press, at least knowingly, and certainly not politely, unless one has a contract that says what one says will not at all be censored and one also critiques, within the interview, the paper that gives this interview. 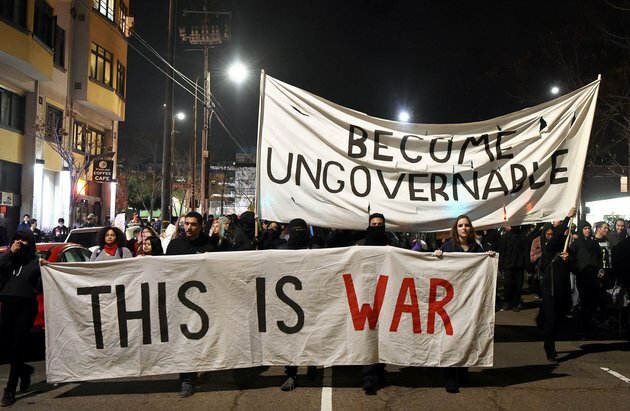 They’re part of the enemy and the whole image of “liberty of expression” (a very constrained “expression”) they promote undermines what, for example, Crimethinc has to say about “free” speech, and gives them a credibility they in no way deserve. 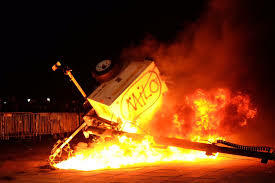 They give the image that this liberal media is open to all critiques and that all critiques are being made in this mainstream, from fascist to revolutionary. 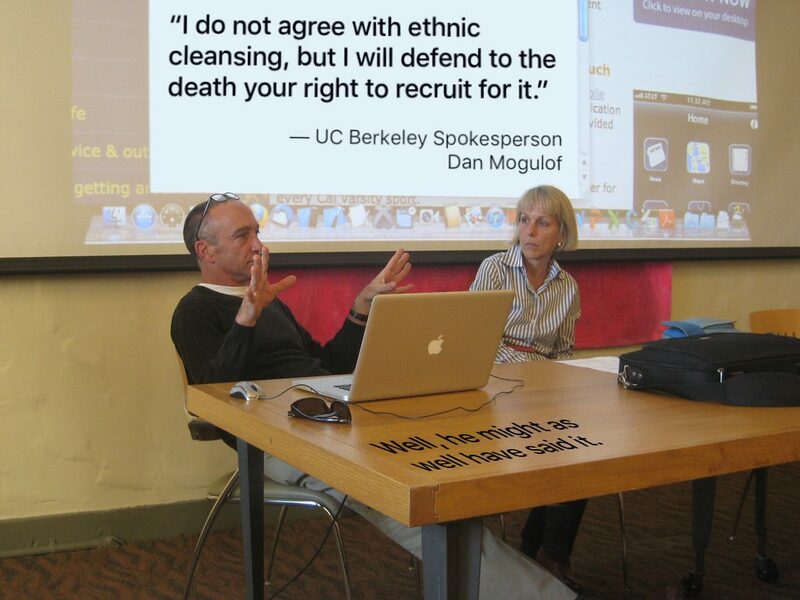 Moreover, professional reporters of “things radical” make their risk-free careers on the backs of those who take risks. Note added 5/2/17: Apparently, though the New York Times gave the impression that they’d interviewed someone from Crimethinc, this was not the case, but simply a quote from their site. …Ohio: part of University occupied against Muslim ban…Delaware: prisoners take over part of prison and hold screws hostage “…the prisoners are against improper sentencing orders. Status sheets being wrong. Oppression towards the inmates. We’re trying to explain the reasons for doing what we’re doing…Donald Trump. Everything that he did. All the things that he’s doing now. We know that the institution is going to change for the worse. We know the institution is going to change for the worse. We got demands that you need to pay attention to, that you need to listen to and you need to let them know. Education, we want education first and foremost. We want a rehabilitation program that works for everybody. We want the money to be allocated so we can know exactly what is going on in the prison, the budget.”…Screw killed Apparently the standoff ended after 18 hours, when guards used construction equipment to smash through a wall, surprising and overwhelming the prisoners. Here’s an interesting one: it appears that, without any intentional co-ordination, drivers in three different countries have been striking against Uber over the last weeks. What would it take to form real, practical, international co-ordination between the Delhi strikers and the Doha and NYC ones – and indeed with other Uber drivers where you or I live? Dunno, but it’s worth thinking about.